Before you get overwhelmed with the awesomeness of Monsters and Misfits III, coming to Takayama, Japan in September, pick up the 2012 Monsters and Misfits II Screen Print Set! This 5 piece set contains iconic characters by Doktor A, Amanda Louise Spayd, Chris Ryniak, Kathie Olivas and Brandt Peters.This amazing set perfectly embodies the legacy of the 2012 Monsters and Misfits show, and is an outstanding 2D companion for many of the recent 3D sofubi releases of Stingy Jack, Stinky Ginger, Calliope, and more. This hand pulled, hand signed, and numbered prints screenprinted by Tiny Bird Press are an edition of 125 measuring 8″ x 10″ on French Speckletone paper. 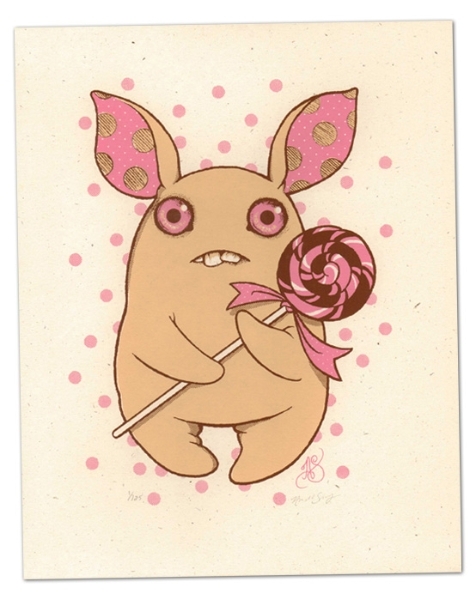 5 prints are only $125, and can be found in the Circus Posterus Store here.